Place the hazelnuts on a baking tray and put into an oven preheated to 180c, gas mark 4, for 10 minutes. Next, put 200g of the unrefined golden caster sugar and 75mlwater into a frying pan and place over a medium-high heat until the sugar dissolves and the liquid becomes a dark-brown caramel. Add the toasted hazelnuts and salt to the pan and stir until the nuts are coated, then pour the mixture onto a baking tray lined with greaseproof paper. (The caramel is extremely hot, so be careful when pouring.) Allow to cool. Empty the contents of the pan into the food processor along with ½ tsp of salt and 25ml lime juice, then blitz until smooth. Pour into a container, cover and place in the fridge to cool completely. 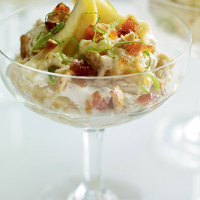 Combine approximately 20g of the praline pieces with the banana purée and the lime cream. Gently fold in the chopped fresh banana and the meringue pieces and move the mixture to a serving dish. Garnish with extra praline and then sprinkle the lime zest over the top.